Also known as cave hunting, caving, cherry picking, or spelunking, cave mining is simply the practice of exploring caves and extracting the ores found there. Ore veins are often found exposed along the walls, floors and ceilings of caves. Exploring a large cave system almost always results in finding large quantities of ore, though you probably will find bigger veins of ore unexposed, because cave generation sometimes cuts off the vein generation, so you may find only a few of a certain type of ore. Cave mining has a high return on investment, yielding more ore per time spent and requiring fewer tools (less pickaxe and shovel durability is lost mining stone, dirt, and gravel) than other approaches. On the other hand, cave mining is highly dangerous. Unexplored caves are dark and tend to contain many mobs; a sword, a bow and armor are practical necessities. The player should carry a large supply of torches to light up the cave and prevent extra hostile mob spawns. Large cave systems can become confusing and dangerous. Special attention must be paid to navigation, lest one quickly gets lost. Moving through a cave too quickly makes it easy to miss unlit passages above or beside you (where monsters can come out), and carries the danger of stepping into an open shaft. This becomes extremely dangerous when you are stuck in there and encounter mobs. You can also fall into a lava pool which will result not only in death but in all of your items being destroyed in the lava. Portions of caves at level 11 and below are generally filled with lava. Because of these factors, players usually carefully explore and light a cave first, then extract ores on the way back out, increasing the total time required and cutting down on mining efficiency. The cave article contains tips on dealing with large cave systems, while the Navigation tutorial has a section on caverns. It is a good idea to carry a bucket of water. Caves often contain random lava flows, and cave areas below level 10 are filled with large lava pools. A bucket of water serves as both a fire extinguisher, if you fall in; and as a way to form obsidian surfaces over lava pools (pour water onto a solid block adjacent to a lava pool; do not stand between that spot and the lava). If the monsters are too much trouble, you can also go to options and change the difficulty to "peaceful" to prevent mobs from spawning. However, you could still die from lava, so don't forget that water bucket! Caves often contain dead-end passages and shafts, or masses of gravel and dirt blocking your way. Many of these dead ends are actually thin barriers that, if removed, reveal continuing passages, sometimes into entire adjacent cave systems. 'Drifting' is a term for simply searching for adjacent caves by digging beyond apparent dead ends. Drifting can be effective in finding dungeons if there are mob sounds audible at a dead end. Once you can make pistons, those can also help spot nearby caves, even through rock: Set one up facing against a wall, and power it with a lever, redstone torch, or whatever. If there's an open space within 12 blocks ahead of the piston, it will push a hole into the wall. Abandoned mineshafts will often be found intersecting caves, but your own mineshafts may well tunnel into one of these. Dealing with them is similar to ordinary cave mining, but resources are more plentiful, especially wood and string obtained from shears (from cobwebs). The string can also be crafted into wool for markers. The special hazards here are that it's easier to get lost in mineshaft tunnels: they look very similar, and pre-placed torches make it harder to know which places you have already explored. As well, abandoned mineshafts contain cave spider spawners which are rather difficult to reach and destroy. Often, there will be more than one in a small area, so even if you do defeat a spawner, be alert of the possibility of more spawners being in the area. There can be two, three or (very rarely) even four cave spider spawners side-by-side within 16 blocks (or less) of one another, but usually, there will only be one spawner within 16 blocks of you. For upsides, due to pre-placed torches, the presence of hostile mobs is much lower. Since supports of tunnels are largely made out of planks, the need to surface due to wood shortage is much lower. 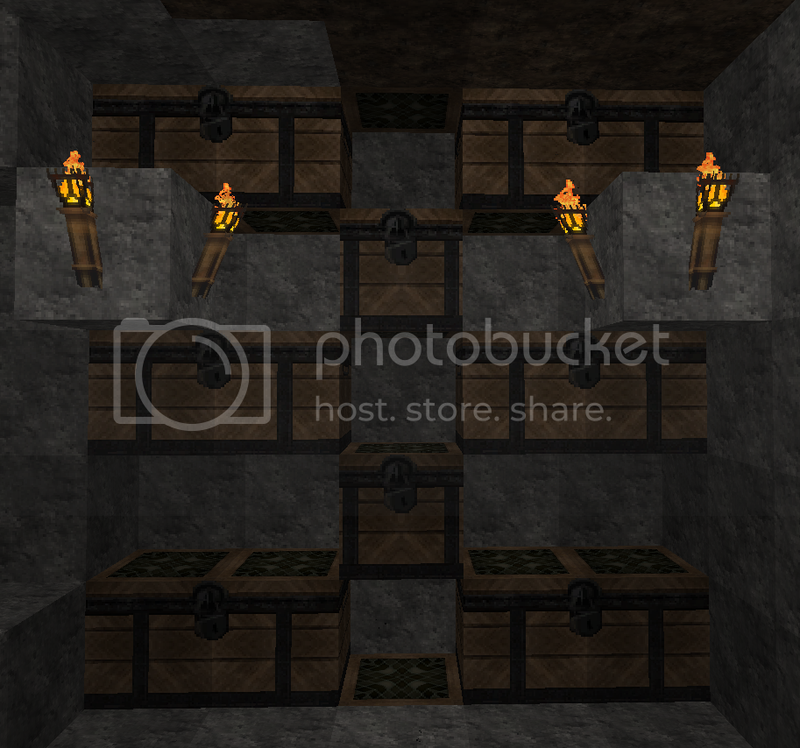 In addition, mineshafts contain broken sections of rails and minecart with chests with loot. One method to avoid getting lost is simply to remove everything from the tunnel, leaving only a 3×3 tunnel. This makes it much easier to recall where you've been, although it takes quite a bit longer (and lots of axes). Signs and other markers are also very helpful here. Since fences are plentiful (those supports again), you can use them to block off unexplored areas or cave spider spawners. If you are mining in an area with sand or gravel, like a desert biome, you can break the sand or gravel blocks and see if any others fall. If any DO fall you know there is something beneath. This can be rather dangerous if blocks fall beneath you, but you can place ladders or dig your way out. If done during the day, hostile mobs will mostly burn or go neutral in the sun, but as always, watch out for creepers. Also, the fallen sand or gravel can cover ores. Another (unlikely) event is that there will be lava under the sand. This is most common under mountains. There could also be a dungeon under the sand, so be prepared to fight or retreat. A pickaxe. If it is your first mining trip, mine some cobblestone and make a stone pickaxe. If you are further along in the game, and expect to mine for a while, bring two iron pickaxes and at least 12 stone pickaxes. Once you have reached diamonds, if you have an efficient style of mine at a depth where diamonds are found, you can use a diamond pickaxe, which lasts a long time and is capable of mining obsidian. Even a partial vein usually provides enough diamonds to replace your pick when it does break, or repair it when it's about to. If you prefer to save valuable materials, take a few stone pickaxes for mining stone and one iron pickaxe only for mining ores. A Shovel. Having at least one iron shovel can get through cumbersome patches of dirt and gravel quickly without using your hands. Just one or two stone shovels also works if you want to use your iron for other things. Later, a diamond shovel is a nice convenience. Torches. At least a full stack is recommended, and more is always better. Lighting the area around you can help you know which areas you have explored and not get lost, keep monster spawns down to a minimum, and find hidden ores in the shadows. Wood. If you run out of tools or torches, you can make a crafting table and sticks to replenish your supplies of pickaxes, shovels, and torches (you can get more coal for them from mining). You can take the crafting table with you when you're done, or leave it as the core of a mini-base. A water bucket. This will be useful in saving your life and your items, should you run afoul of lava. Also, if you come across a lava lake or pool you want to cross, you can flood it to turn the lava into obsidian. Water can also be placed to create a waterfall, to descend any shafts or ravines you come across. More experienced players may also substitute a water bucket for ladders. An empty bucket. A spare bucket is useful for collecting lava to use as fuel in a furnace, to block or slaughter monsters (you'll lose most of their drops), or just to get the lava out of your way. You can also use it to pick up more water from a spring, perhaps after placing a waterfall. A second bucket of water will also let you create a perpetual water pool from which you can then refill either or both buckets whenever you want. The easiest way to make an infinite water source is to make a 2×2 pit one level deep, then empty two water buckets into opposite corners. This will let you refill your bucket(s) from any of the pool blocks. Food. Prolonged visits in mines will wear away your hunger bar. Bringing food will allow you to spend more time in your cave system, and keeping your hunger bar full is important for healing. If there are mushrooms present, you might carry or make a bowl to make mushroom stew. Weapons: A sword (stone or better), a bow, and plenty of arrows. These will help you defend yourself against monsters. Upgrade to a diamond sword as soon as you can, as it will make fights noticeably shorter. Armor. It will protect you from the monsters you may encounter, and will even protect you from lava. In general, you want at least iron armor — if necessary, you can smelt ore and craft your armor in the caves. Chests are invaluable when exploring lava caves since you can store your items in case you die; instead of losing a whole stack of iron and half a stack of gold along with all of your food and weapons, you can drop a chest and a crafting table nearby, and lose only your current tools and whatever you hadn't stashed yet. It's worth writing down the coordinates of your stashes, just in case. Ladders. For when you've fallen down, and can't get up... Also useful for reaching high tunnels and blocking off flooding water. Signs. These are useful to mark your way in a cavern. Leave messages or ASCII arrows for yourself, such as "EXIT -->", "Base with Bed ^", "Zombie spawner this way", or "mind the holes!". Signs can be stacked, which makes carrying a supply much easier. Signs can also block water and lava. (Optional) Fences. Useful not only for blocking off unexplored passages, but for containing waterfalls and rivers when you can't bucket the source. As noted above, you can also harvest these in abandoned mine shafts. (Optional) Markers of various kinds. Aside from the above-mentioned signs, wool will be available early, and redstone will turn up when you get deep enough. If you have pumpkins available, jack o'lanterns provide both light and direction. (Optional) Dirt, cobblestone, gravel. You'll certainly be picking some of these up along the way, but starting off with some cheap blocks will let you plug holes, make quick staircases, block off lava and bridge your way across pits and ravines if staircases are too expensive or time-consuming. (Optional) Saplings and seeds. You can create an underground tree farm to replenish your supply of wood and a small wheat farm to continuously grow wheat for bread, allowing you to stay underground for an infinite period of time. These should both be built in a safe, well-lit area, to prevent spawning of hostile mobs and to encourage growth. (Optional) Doors. In conjunction with solid blocks, wooden doors can be used to temporarily block off unexplored caves and prevent hostile mobs entering a secured area. The crafting recipe for wooden doors creates three doors from six wood planks, hence each door uses two wood planks - the same as what would be required to block a 2 x 1 hole but with the ability to pass through with ease, and return in a hurry if there are a large number of mobs on the other side. Some Zombies can break through wooden doors on hard, and consideration should be given to this when playing on this difficulty level. After an area is neutralised the doors may be mined and placed deeper in the cave system, or left as a marker/decoration as well as giving protection against a surprise creeper explosion making a section of cave unsafe again. Also known as Vertical Mining and Shafting, Shaft Mining consists of digging your own tunnels to expose hidden resources. The usual warning for digging applies: Watch out for uncorking lava or water or for digging into a deep drop or inhabited cavern. While doing this, make sure to be careful as you might remove a block holding back lava or separating you from a drop or hostile mobs. A straight staircase heads down, but also over. This may or may not be useful—with a map, you might learn about more of the surface you're going under, but if you need to dig your way back up a different way, you may come out in unknown territory. Also, a long staircase from your base may take you out of chunk-update range from your base, or at least far enough out that further exploration will take you out of range. Then your crops won't grow and so forth while you're mining. All of these can be 1, 2, or even 3 blocks wide. The most basic strategy is to mine in a straight line at a 45° angle downwards, moving one block across for every block down. If you dig out four blocks above each step instead of three, climbing back up will be rather easier, since you won't "hit your head" with each jump up the steps. Placing a torch every 5th block will help you keep track of your elevation, and maintain a decent light level. Alternatively, you can dig diagonally. Face a corner, and imagine that the corner block is the missing block of a 2×2×2 cube. Now dig that cube. Repeat, adding torches at every step. This takes more effort for each level dropped, but will expose more blocks along the way. You can also dig a shallower stair, two blocks ahead for each block down. This will take you even farther away horizontally, but will make it much easier to run minecart trains up the stair. Spiral staircases are slightly more complicated since they have frequent turns, but have the advantage of leading straight down, thus staying in the same chunk(s). This gives you a more targeted dig, and can often reach bedrock quicker and more safely than straight staircases. Starting from a flat floor, dig one block ahead of you, then dig 2 blocks down to the right of that. Then move forward into the first place you dug, turn right to face the second step, and to its right dig 3 blocks down from the floor. The fourth step will put you below your original floor—leave the floor block to become a ceiling, and dig the three blocks below it down to the new step. Continue with this pattern—note that each turn of the stair becomes the ceiling for the next turn. This design drops 4 layers per full turn, but if you run into gravel, you will need to place dirt or cobblestone to replace it for your stairway. Turning right will get you a clockwise spiral, you can of course go the other way for a counter-clockwise stair. One design is a 3×3 horizontal grid. By digging one block down at a time, and moving around the perimeter of your 3x3 area, you will have enough head room as you move down the staircase. You can also add stair blocks to this setup as well. You can optionally leave the central column for a barrier, or mine it out to place ladders for speedy transit. Instead of ladders, you could use a waterfall, but you'd have to place that after "finishing" the stair (dig an extra pit beneath the bottom of the column to prevent flooding). You'll also have to dodge out of the water column occasionally to breathe. The basic design drops 8 layers per full turn. You could build this as a shallower stair (4 layers per turn) for minecarts, but minecarts will have trouble with the corners anyway, because of the rock around them. This is similar to the 3×3, except that you dig out the edge of a 5 by 5 grid. The center column is cleared, acting as a supply of light on the way down. The middle acts as a safety barrier, and the outer ring has the staircase itself. The middle can also be hollowed (digging straight down should be safe so long as you didn't find any caves or lava pools as you made the staircase) out and a ladder or waterfall can be placed in it, with openings at different levels to allow for quick and easy access. Note that climbing ladders does not deplete hunger, unlike walking and jumping used to travel the outer ring. Swimming does deplete hunger, but since you have less distance to travel, you still come out ahead. This design drops you 16 layers each full turn, and provides an exploratory dig over a wider region. At the same time, it has a bigger chance to miss things in-between the spirals. This is variation of the spiral which consists of a spiral of 5×5 rooms leading down. Simply dig a straight staircase down for a short while, then dig out a 5×5 room and add a torch or two. Turn right or left, and dig another staircase for a short while, and dig out another 5×5 room, add a torch, and so on. Remember to always turn the same way. This method allows you to find a large number of ores and such. If you hit bedrock, don't worry — go back up to your first room and turn the opposite direction this time. It is very helpful if you want to avoid lava and such. It also has the tendency to open up underground caves, which are always well-stocked with ores and gems. Just remember to be careful of monsters, so always bring a sword when using this method. Vertical shafts are mined vertical tunnels used to gain access to underground mining sites. They can be of any width starting from (if you're crazed) 1×1 blocks. Don't forget to keep a water bucket *and* a stack of blocks in your hotbar, to deal with lava quickly. Aka, "Digging straight down". Do not do it.You will fall into a cavern or lava. If you absolutely must be the crazy one, try this: Put a bed and a chest at the top. Sleep in the bed, and put everything from your inventory into the chest except for pickaxes, ladders, a stack each of gravel and cobblestone, and perhaps some torches. Dig down until you die or reach your target depth, placing ladders above you as you go. Every 5 levels or so, cut a 2-block high foothold opposite the ladder. If you fell into a cavern and survived, pillar jump back to the hole you fell out of, and/or build a cobble pillar in front of you, and put ladders on that. If you fall into a cavern and die, the footholds might let you break the ladders below it so you can drop gravel for a pillar, and perhaps retrieve any ore you found on the way down (watch out for mobs). If you fell into lava, you can forget about the ore, but perhaps you can drop water to quench the lava. It is possible to do this method safely, but it is very time consuming. It's the same as before, except hold ⇧ Shift to cling to your ladder while mining straight down. This way, if you mine into a pit or lava, you won't fall into it unless you let go of shift (shift won't let you move down the ladder, but makes you mine slower). If you do find a cave, you can climb up a little bit, remove the last ladder you put down, and put a bucket of water there instead. Now you can swim down, and if there was lava under you, it will turn into obsidian, and will be harmless. You can also dig 1 deep/2 wide alcoves in the side, giving you a place to put a torch, rest, and most importantly dig the hole deeper (as far as you can reach) without having to hold onto the ladder. Note that mining upward in a 1×1 shaft can actually be safer, if you are placing ladders as you go up. Lava will be blocked by the ladder, which can't burn (and even if it could, there's no place for a fire block to appear). Similar to 1×2, but you have more room to place torches, ladders, or footholds in case you fall off the ladder. You also get more warning of gravel masses, caverns, or lava, and an extra block of room to deal with them. This is relatively safe, and is a good way to start a mine from within your base. The more common version runs the ladders down the middle of the wide side (put blocks to break your fall on both sides every few levels, and at your mining levels), but another way to do it is to put ladders on one end, and put a waterfall on the other. You can then put a few blocks in the middle to prevent falls, but leave plenty of spaces to pop out of the waterfall for a breath. You want to excavate one level at a time, placing ladders down one corner of the square. Also relatively safe. Cutaway of the top of the mineshaft. (1) Entrance passage (2) Ascent shaft (3) Descent shaft. Cutaway of the bottom of the mineshaft. Note the placement of torches in the ascent and descent shafts. (1) Ascent shaft (2) Descent shaft (3) Water pit (4) Side passage to utility room/mining area. The wood requirements amount to approximately 60 blocks of wood. First, gather and manufacture the materials. Be sure to fill the buckets with water. The shaft will be constructed to the side of an existing room. Start by excavating a 3-block deep alcove. If the top of the shaft is above ground, it should be surrounded by fences or walls with only one entrance on a narrow side. Place one torch in the end of the alcove as illustrated. Next, a 3-block wide pit will be dug all the way down to the bedrock. Do not dig out the block you are standing on. Dig out a 3-high by 2-wide section, then hop down into it and dig out the 3-high column that you were standing on. Place torches on both sides (ascent and descent) at regular intervals, excavating 1 block to place them in. In the ascent shaft, torches should be placed in the wide sides so they don't interfere with the ladder. In the descent shaft, torches should be place in the narrow side, primarily so that you can keep track of which side is ascent and which is descent. Be on your guard when digging out any blocks beside you! Lateral breaches into lava pools or monster caves can be hazardous. Be ready to plug the hole, or hop up and throw blocks down so you can escape upwards. Also, be sure that the 3x2 section hasn't opened into a cavern before you hop down. Keep the pit well-lit. When you reach the bedrock, make a 3-deep pit on the descent side. Fill in the middle and ascent sides as needed, as in the screenshot. The water trough in the utility room. In the middle of the shaft, cut a side shaft. Due to the fact that the landing pit must be 3 deep, you may want to stairstep downward a few blocks in this shaft. Next, dig out a utility room. Cut a 3×1 horizontal trough in this room for water. Empty each bucket into the end of this trough. The water should fill it in and become still. Fill the buckets again from the center of the water trough. Use the water to fill the pit at the bottom of the descent shaft. Be sure that the pit is 3 deep, and each block is filled with water. Now it's time to place the ladders and to fill in the center of the shaft. Stand in the ascent shaft and face away from the descent shaft. Place ladders on the wall in front of you and climb. Build the ladder all the way to the top. Descend to the bottom again using the ladder. Be careful, because the center of the shaft is not filled in yet, and it's possible to fall to your death. Once at the bottom, stand in the middle of the shaft and fill it with blocks. Hop upward and place blocks beneath yourself. When you reach the top, leave the central pillar 1 block below the surface (see screenshot). Leaving it 1 block lower allows you to enter the descent shaft simply by walking in. Instead of a 3-block deep water landing pit, if you place a single block of water (use two blocks if the drop is greater than 60) at the bottom of the shaft in the ceiling of your utility room at the bottom and "hold it in place" with a sign on the wall below the shaft, it will break your fall as you fall through it and you will land without damage on the bottom of your utility room area. Beware this may be taking advantage of a bug in the code but it is the fastest and easiest way to go down a deep shaft. Main shaft/access shaft: a 1×2 or 2×2 tunnel use accessing other tunnels. Efficiency: how many ores you get for the amount of effort you put into the mine, or how many ores you get/how many cobble you dig to find them. Thoroughness: how many of the ores you extract per chunk. The tradeoff: a mine can be made more thorough at the price of efficiency, or vice versa. Layout: the top-down view of the mine. Branch: the tunnels dug purely to gather ores. Branch-length: how many blocks you dig your branches out. One recommendation is to measure a length with the durability of a stone pickaxe. Spacing: how far apart the branches are. Completely Thorough: a mine that reveals 4 new blocks/block dug, and reveals every block within a chunk, is completely thorough. Tiering: "stacking" one branch mine on top of another, in order to obtain a much greater degree of thoroughness without sacrificing too much efficiency. Efficiency in Minecraft mining is defined as how many ore blocks you mine, relative to the time spent reaching them. Thoroughness is the percentage of the ores you extract from a given chunk. Efficiency is approximated by blocks revealed per blocks mined, while thoroughness is approximated by blocks revealed per blocks in a chunk. Since both include "blocks revealed", they are often confused. If we assume that all ores spawn in 2×2×2 cubes or smaller, then there is no need to reveal every block. Mining three spaces wide, with four blocks between each shaft will be completely thorough. If we assume that 90% of ores are 2×2×2, but 10% are 1x1x1; while obtaining 100% unitary thoroughness then requires a spacing of 3 and a tiering distance of 2, the original mine (the 3-space 4-tiering) maintains a thoroughness of 98%. The 100% thorough mine requires mining twice as much stone while only increasing the total yield by 2%, resulting in half the efficiency. Ore occupies a certain width, whereby two tunnels running too close to each other would intersect the same orebody twice. In Minecraft these assumptions are essentially true, though there is some distortion since diamonds only spawn once per chunk. So we reach the crux of the argument; tunnel spacing. In the traditional "efficient" mining methods, tunnels are spaced close together in order to "observe" the maximum number of blocks possible, therefore removing all of the ore from an area. So, let's consider a spacing of 1; that is one tunnel separated by one block from another tunnel. During the digging of the first tunnel, several ore bodies are encountered. This tunnel has a high efficiency (in fact, the maximum efficiency possible, as we shall see later). The second tunnel has a very low efficiency because almost all of the ore bodies it encounters have already been removed by the first tunnel. This causes the efficiency of the mining operation to plummet. A spacing of 1 is incredibly inefficient. Now we move to a spacing of 2. This is a spacing that a lot of people use because it leads to 100% observed blocks in a single layer. However, with a spacing of 2, the second tunnel still encounters several ore bodies that have already been removed, so it is also quite inefficient. We can go on like this; as long as the second tunnel has a chance of encountering ore bodies which have already been removed by the adjacent tunnel, it will have a less than maximum efficiency. It follows that the most efficient way to mine is to place the second tunnel far enough away from the adjacent tunnel that there is no chance of encountering ores that have already been removed. The results indicate what is expected — that when tunnels are close together they are not efficient because the miner will encounter diamonds which were already removed by the adjacent tunnel(s). A maximum efficiency is reached at a spacing of around 6 blocks (that is, 6 solid blocks left in-between the tunnels). At this spacing, efficiency is about 0.017, corresponding to 1.7% of blocks removed being a diamond. At this spacing, the tunnels effectively become independent of each other and so, statistically speaking, the chance of encountering an ore are maximized because there is no chance the ore has been removed by an adjacent tunnel. Above a spacing of 6, efficiency does not increase greatly because ore collection rate is simply a function of the distribution of ores within the level. Note: in the above graph, efficiency appears to drop-off at a spacing of 10. This is simply a limitation of the size of the level used to model the process, resulting in a large error at high spacings. If a larger level were used, the line would smoothly come to a maximum efficiency and stay there. The term "efficiency" is often applied to the practice of making every block observable, however this is not usually the objective of a miner. A more practical definition of "efficiency" describes the percentage of blocks removed that are ores, in other words efficiency = (ores removed / blocks removed). Maximum efficiency is reached when adjacent tunnels become independent of each other, since there is no chance that an adjacent tunnel has already removed an ore. This maximum efficiency, for diamonds, is reached at a spacing of 6. Since other ores are usually collected in copious amounts compared to diamonds, this spacing is recommended for every-day mining operations. Branch mining consists of mining out side tunnels from an access shaft to expose as many blocks as possible with a minimum of blocks removed. A tutorial video on Branch Mining is below. Creating a Branch Mine is simple. First, dig deep underground until 0-16 blocks above the bottom level. To keep track of this, press F3, and the Y-Axis tells the level of depth the player character is currently at (It is best to mine at level 11 because it is easier to deal with lava lakes on that height). Upon reaching the desired level, begin to dig at least 20 blocks into a wall to create a shaft. Come out of the shaft, move at least 3 blocks to the left or right, and do the same again, digging 20 blocks into the wall. Each shaft made will almost always contain a resource block ranging from coal, iron, redstone to even gold and diamond. There is a tradeoff between the distance chosen for each branch of your mine. A distance of 2 blocks per branch means that you will end up exposing almost every block, but at the cost of a lot of work. A distance of 5 blocks per branch will give you a wider distance covered but there is the possibility of missing some ore veins, especially diamond or lapis lazuli which can appear in veins of less than 4 blocks. Using the diagram titled Better 3 Space leaves no ores hidden, however requires you mine more stone. It is recommended to use this method if you don't mind mining a bit extra and really need the gold, redstone, diamond, iron, and coal. Another option is the per-chunk branch mine. This is a 2 space branch mine, but is constructed over the space of a single chunk, and is capable of ensuring that every ore deposit is found, while still only mining around 45% of the chunk's stone. For the initial shaft to bedrock for this mine, a 1×2 shaft will fit lengthwise in the central corridor. An effective technique if you want to find rare resources with minimal effort. It is basically mining down to any level, usually to bedrock, and then mining outwards to the sides, much like a tree with a trunk and branches. Use the staircase method to dig down to bedrock. Go up 2 blocks and fill any space below you mined out. Dig a straight 2×1 tunnel in a straight line then dig out 32 blocks every 4th block. (Optional) If you don't want to count to 32 every branch,dig out a "Marker" 1×1 tunnel 4 blocks in and stop by it in the next branch. To further increase efficiency, you can end the 20-block tunnel by digging 4 blocks of an 1×1 tunnels as each of the mined block reveals more than a 2×1 tunnel. This method is based on the relatively low probability of desirable blocks being created without any neighbors, so it will occasionally miss small/narrow ore deposits that fall entirely between the branches, but it covers ground faster, so you'll usually get more ore for your time. If you'd rather be sure of 100% coverage, simply place the tunnels closer together. It is also meant to be done quickly. Each branch can be any length, but about 32 blocks long is a good length to begin with, as it can be measured with the durability of a stone pickaxe. The Pinwheel Mining layout is designed to cover large squares of land, over long periods of time. Note: If you use a simple straight staircase to get down, you may need to leave off the south tunnel for a while. Mark the branches at the desired interval. The picture shows a spacing of 2, which is 100% thorough but inefficient. On the way back, place torches in any dark spots, and collect any missed ores—collecting all the coal is advised, but not required. As always, you can use any spacing; a spacing of three provides both reasonable efficiency and reasonable thoroughness. This layout can compete with the phoenix mine in terms of efficiency, and is easier to modify if necessary, but it does require a lot of time for each trip. Dig a room that is 7 blocks long, 10 blocks wide and 3 blocks high. Have your stairway/ladder in the middle of one of the 10 block walls, preferably 2 spaces wide. Starting in one of the corners, dig parallel to one of the walls of the room you just dug, for 20 spaces, placing a torch every 5 blocks. Then, dig another 20 block tunnel that has two blocks between it and the previous tunnel. Continue until you reach the other side of the room. By utilizing this variant properly you can uncover all the blocks in quite a large area, and the mineral yields are quite high. Having the stairs 2 blocks wide allows for thorough strip mining as they can be strip mined around. Also, a good length for each tunnel is 20 blocks long. A feather mine is a variation on a traditional branch mine, but designed to have a better blocks-revealed to blocks-mined ratio. Like a traditional branch mine, feather mines have several parallel 2×1 shafts that branch out of a main trunk shaft. However, they are much further apart than in a branch mine (13 blocks as opposed to 3). The reason for this is that as you dig the 2×1 shafts, every 4th block forward you go, you dig a 1×1 hole to the left and the right, revealing many previously hidden blocks. The mine gets its name from its feather-like shape when viewed in a cave map or with an x-ray texture pack. The most efficient way to apply this method is with 2 block spacing, as it renders it impossible to miss ores. Feathering is also arguably the most efficient mining method. When viewed from the side, it is clear that it reveals the most ores with less mining than the traditional branch method. Advanced branch mining is one of the most efficient way to mine 100% of the ores on multiple levels. This setup allows for linear navigation along tunnels by first selecting depth, then choosing an appropriate tunnel at that depth. Tiered branch mining is the art of stacking shaft mines on top of one another. If you decide to stack your mineshafts, however, you should use an odd-spacing, or you'll get inefficiency AND blind spots. For instance, the following tiering has the advantage of being very efficient, while finding any 2×2×2 cube of valuable ore. It has the disadvantage of missing some of the smaller veins, though it doesn't miss as many as you might expect-it yields somewhere between 80 and 90% of the ores in a region. This is a good mine for single player if you can't stand the mere possibility of leaving a 2x2x2cube of diamonds just below or above your initial mineshaft-this will find them. This is a good mine for somewhat crowded multiplayer, where thoroughness is actually worth something. This particular tiering, however, is not only inefficient, but requires one of the access methods shown in the pictures-either an 8 tall, 2-3 wide tunnel with staircases as shown in the gray picture, or with one access shaft for 2 sets of layers. This should be used only in ridiculously crowded multiplayer servers, when what matters is finding that one redstone vein that got missed by all the random-miners. However, nearly any spacing and layout can be used with a given tiering distance., as it is fairly thorough, only slightly less efficient than a straight shaft, and it can be transformed into nearly any level of thoroughness without wasting effort. Nearly any layout, spacing, and branch-length can be combined with any tiering distance, though doing it with a phoenix mine on the compact spacing is NOT recommend for anyone who gets headaches easily. Speed mining is a technique of mining in which a player randomly mines out a 50 block radius around them. Using an Efficiency V diamond pickaxe, along with beacons for Speed I/II and Haste II, minerals can be acquired rather quickly. It is at first expensive, but pays off quickly. It is suggested that you do this at diamond level. Best results are obtained by using an Efficiency V Silk Touch I diamond pick to mine and collect ores, then smelting the gold and iron and using a Fortune III pick to mine the other ores. Facts: Within an hour, Etho collected 3 stacks of iron and a stack of gold using this technique, as well as 10 diamonds and 4 stacks of Redstone blocks and many unmined ores. He then threw away the diamonds to demonstrate how much ore he was getting from this. This technique is to take off the top 6 layers of a mountain completely. Continue until your mountain is entirely flat. TNT is useful for the first 5 layers, since the explosion will destroy grass and dirt for the most part. First 5 layers are gone when you start mining. This time consuming method is a useful tool for when you need minerals or a flat area. Quarry Mining is very similar to strip mining, sharing the prospect of taking all resources within an area. These mining methods are used very commonly in minecraft. The difference between quarrying and strip mining is that the process of quarrying involves a large rectangular or square strip, continually mined downwards with a staircase running along the side. This method got its name by its similarity to real world quarry sites. Quarries are typically ceased when a large cave is discovered (This does not directly stop the excavation, it just makes it difficult to continue), the miner abandons the quarry for another project, or bedrock is reached. A way to deal with large caves is to block the cave with Creeper-resistant materials, like Obsidian. One can place a minecart track(powered) in a spiral, to allow ease of access. A finished quarry with obsidian and lava at the bottom. A recently begun quarry. There is a convenient, easily accessible ledge with chests, furnaces and a crafting table. The inside of a quarry. An elaborate 64 by 64 blocks quarry in the making. A 16×16 quarry being looked at from the top. Looking up from the bottom of a quarry mine. A 25×25 quarry to bedrock. Once you have found a large enough space, dig down one space at the corner of your site. Next, mine the block adjacent to it. Continue this around the perimeter of your site until you have a 1-block-deep trench around the perimeter of your site. Now that you've set your perimeter, mine all of the surface blocks within your site. When this is finished, you should have a large, square, 1-block-deep hole in the ground. Next, head back to the first corner that you dug in, and dig down one more block. Repeat what you did in step 1, but now you will be one level lower. Upon completing this level, you can begin placing your staircase/ladder/vines as well. Continue the process of mining a layer, and then another, until you hit bedrock. This may take a few days of vigorous playing to accomplish, but your earnings will make it well worth it. For reference, 20×20 quarries (down to bedrock) typically yield 3 - 10 stacks of coal, 1 - 7 stacks of iron ore, up to half a stack of gold ore, perhaps 50 redstone dust(lower down), and a few Lapis Lazuli and diamond gems, though these results vary with the width, depth and location of your quarry. Various game mods may also provide tools for quarrying or similar rapid-mining techniques. Really reckless miners have been known to make HUGE quarries, some giant ones are 50×50, 64×64 and 80×80, yielding a staggering 2200 stacks of cobblestone/stone. To put that in perspective, that many cobblestone blocks in a tower would be a whopping 140,800 meters tall, or an unrealistic 170 times the height of the Burj Khalifa, the tallest building on earth. These will take a couple weeks of 24/7 gameplay, given their size, but the stone payoff is gigantic. Although the yielded amount of cobblestone, dirt/sand, coal, iron, and to some extent gold, will be enormous, and the possibility of lava is very high, this is not the best method for mining diamond and lapis lazuli, because they're found only at the bottom of the map (Note: Diamonds and Lapis Lazuli CAN be mined using this method, but due to their rarity the placement of the quarry along with its size will determine the amount). This type of mining is suggested for getting large amounts of cobblestone, iron and coal, besides the ability to gain large amounts of resources, this type of mining exposes many caves for further exploration/mining. Besides mining, quarries also offer some non-resource related benefits, such as keeping the area clean and fresh (not ruining the nature), as well as serving as a handy trap. Warning: Be extremely careful around this mine, as a fall will surely be fatal, unless you covered the 2 bottom levels of it with water. Make sure the shaft is either covered up by a layer of blocks or a fenced perimeter. The shaft should also be well-lit to avoid being a mob pit. Due to the open nature of a quarry, many players choose to build an intricate base floating in the quarry, and then fill in the unused space with dirt, gravel, sand and stone. If done correctly, an underground base will be undetectable from the surface, especially when grass grows on the surface above it. For extra stealth, consider planting trees in the open area. You can deter miners by placing a large lava lake over your base. This will also decrease hostile mob spawns around your base. When your quarry is complete you can fill the area with a structure such as a skyscraper or a tall building. This is more effective than building at sea level as some buildings can be taller than 256 blocks, so you can build from bedrock level and make larger structures. These are made by the same method as an underground base, except the open area is filled with water from artificial springs, lakes, rivers, etc. For additional effect, a lot of players build underwater bases from glass blocks, and build airlocks for extra stealth. Most quarries are square or rectangular, so it is hard to disguise an underwater base as a natural lake or pond, but with a little bit of work, you can make it look like a natural body of water. After finishing your quarry, the large area mined out can make a perfect space for creating a large multi-level grinder. This involves digging a long tunnel. You will need a lot of wood (for sticks), and optimally, crafting tables, chests, and furnaces. The simplest tunnel is 2 high by 1 wide, but the wider and higher the tunnel, the more cobblestone you get per chunk you explore (you will not gather cobblestone any faster, also you will get less ores). Dig at about level 50 if under land; 40 if underwater; or 12 if for precious ores. You may want to use the cobblestone to seal off caves already explored. This is like a quarry — but more useful since less resources are spent going through the dirt/sand layer, and it can also be used in conjunction with minecart tracks to go from one base to another. A 4×3 tunnel that is 1800 blocks long will yield as much as an 18×18 quarry to bedrock, though arguably safer as you won't hit the lava layer, and it will yield more diamond/redstone if at layer 12, as well as the fact that falling in is completely non-lethal! A 2×1 shaft is probably the highest-yielding way of mining... for ores that is. Mathematically, a 2×1 shaft reveals 8 blocks for every 2 blocks mined forward, so the basic premise of this system is that digging little 10-block deep side shafts off of your main tunnel, as in branch mining, does not yield any more ores than digging straight as your yield will be highest if you simply keep moving forward and mine endlessly instead of stopping a 2×1 shaft will also lead you into plenty of caves, which could be good or bad depending on how you feel about those. A good strategy for cave run-ins is to make a quick run-down and nab any visible ores, then find your shaft and keep moving. If you don't want to walk all the way back home after digging this, just dig in a "U" shape until a little less than half of your pick is used up, move 8 blocks to the side, and go back. The 2 biggest problems with this kind of mining are: A. It takes a lot of torches, though your coal yield is way higher than the amount you spend on torches, and B. You cover a lot of distance, therefore your chances of having lava run-ins are pretty high. A variation on this kind of tunnel-mining is to drill a finger tunnel into the stone for 20 blocks, placing torches as you go; retrieve any ore found; then recover the torches as you exit, plunging the tunnel back into darkness; then block up the entrance to the finger tunnel with just two blocks of surplus cobble. By leaving the finger tunnel unlit, (and unfilled in), it's true that monsters may spawn later, but they are trapped in the walled-off tunnel. Be careful not to mine back into the same area later and, yes, there is a low chance that monstrous noise might become disconcerting later. This involves digging a quarry and adding ledges every few blocks down around the outside while digging. The sides of the quarry have to be a certain length, for example with a two-space branch mine, you need each side to be 3n+1 [(something divisible by 3) + 1] blocks long. The result will vaguely resemble a shopping mall atrium with one massive open space and then a bunch of "shelves". Then, dig the shafts to at least 20 blocks for a ton of ores, including quite a few diamonds (about 3 veins) down on the lower levels. For a 10×10 quarry, you will get about 150 stacks of cobblestone, while for larger mines (e.g., 40×40) you will get around 2000 stacks, handy for massive building projects. This involves basic quarry technique but in small squares. First you decide how large you want your mine to be. For example I would use a 2 by 2 square quarry, so I would make a 3 by 3 hole then go over 1 block and repeat. And this allows for maximum ore exposure. But you would need at least a 3 by 3 squares, going all the way to the bedrock. WARNING: this can be very dangerous, as you can run into hidden caves, dungeons, lava pools, and abandoned mines. For those who favor mining in a straight path but try to not make it very long. Once you reach bedrock level, go up a few blocks and start mining and make it a large corridor. If you reach a cave, continue to make the large corridor (but secure the cave first). This will give you large stores of cobblestone and more of a chance of finding lava. Find ores that are nearby that would be hidden if you did another technique and did not get lost in your mine. This a very basic technique yet a tiring way of mining. It is suggested to use a diamond pickaxe with max efficiency enchantment and unbreaking enchantment so that the pickaxe doesn't break during the process and also consumes less time compared to using a non-enchanted stone pickaxe. TNT mining is dangerous and can destroy the ores you're looking for. If you must do it, you can use the 3-in method: Find a solid stone wall, mine 3 blocks inward, and then you place 1 block of TNT on the 3rd hollowed out space. Once placed, with flint and steel in hand, you right-click it with the flint and steel and back up a few steps and QUICKLY block off the front of the hole with one block of stone. The explosion should create a perfect 4×3×3 hole. Repeat as desired. A much faster (but risky) technique is mining in a small alcove, filling it with multiple units of TNT, and igniting it, creating a fairly large cavern. While this variation uncovers a large number of blocks at once, the explosions destroy most of the blocks, potentially including valuable ores, and the explosion can let a large amount of lava to leak in, making the cave hard to access and burning any blocks spared by the explosion. TNT is expensive to manufacture (requiring 4 sand and 5 gunpowder to make 1 TNT), thus another mining technique to maximize the use of each TNT is to dig a 2x1 tunnel 4-5 blocks into the wall, then at head height mine 2-4 blocks (depending on desired size of hole) to your front, right, left, up and down. Place 1 block of dirt to act as a stand for the TNT to explode in the middle. The explosion should create a roughly spherical shaped hole averaging 8 blocks in diameter. This method destroys more blocks per TNT but requires more use from the pickaxe in order to carve the space around the TNT. Since this only creates a single explosion unlike the previous technique, the items dropped from the broken blocks will survive. You can use silverfish to clear a lot of stone away to reveal the valuable stuff. To do this, get a bunch of silverfish in a hole, and position yourself above the hole. Most of the silverfish will go into the stone, but make sure there are at least some left visible. While standing above the leftover silverfish, throw a splash potion of poison, then a splash potion of regeneration immediately after. Every time the poison hurts the silverfish, it will call any nearby silverfish out of the stone, then it will get healed by the regeneration potion, so it can keep getting hurt (instead of being pinned at 1 health). Soon, all of the silverfish will come out of the stone, and you can kill them at this point, then mine all of the minerals left behind. The easiest way to transfer silverfish to different places is by leading them through the nether. You can do this by putting a nether portal by a silverfish spawner (easy enough to lure them through, but you'll need a path of blocks they can't enter), and another portal for yourself, farther away with a different exit. After luring a batch of silverfish through their portal, you go through yours. You will have made walls and a trail in advance. The walls and trail contain the silverfish, but lets you see them and them follow you without being able to reach you. Two levels with a glass walkway for you (above their path) can do this, just make sure they can't reach your level (and none of the blocks are stone they can enter). Also, they may need to see you once without glass, so they know where you are. Then lead them to a third portal leading to your mine, and voila, you've transported them to where you want to mine at. Piston mining is a technique for safely extracting small amounts of valuable ores, usually diamonds, and for inserting 'windows' into potentially dangerous spots. Start by digging a 1×2 hole in a safe spot a few blocks to one side of the target area. If no truly safe spot is available, pick a location where the risk is least. Place a block and a piston in the hole. Any block moveable by a piston will do. Glass would allow you to see hazards without triggering them. An efficient method is to place one block of glass, then use 'filler' material for the subsequent blocks. Dig another hole a few blocks to the other side of the target area, ideally in another safe spot. When doing this, don't forget that the maximum distance a piston can push is twelve blocks in a straight line. Activate the piston using a redstone torch, lever, button or pressure plate as you prefer. Insert another block, re-open the 'receiving hole' if necessary and reactivate the piston. Repeat until the ore can safely be collected, or your glass block has revealed a hazard or confirmed all is safe. Note that you may need to check several rows before you can be entirely sure there is no danger. Retrieve the piston for reuse. This mining method is only practical for collecting very small amounts of ore, but it can be useful for collecting diamonds from dangerous spots or when you suspect a natural hazard is nearby and you want to locate it precisely. This section is for mines that focus more on aesthetics rather than efficiency. A mine of mine (No pun intended) I decided to talk about, seeing as how few aesthetic mine designs there are it should be a welcome change. Mind you don't expect to do all the connections, let alone open/maze connections (Variations section) unless you're on a server, or you have a will you can break diamond on. This design consists of a Hub and a Push leading into another Hub. Each push is basically the design behind it (The side view) dropped a square repeated several times, the amount is dependent on the miner but an even number is preferred due to torch placement (Discussed later) The central hub (The first hub made in the mine) will have 4 pushes in each of the cardinal directions, eventually, if you are in need of ores you may choose to go down in one direction until you have what you need. I recommend you check your y coordinate about now, you may want a push length that will allow you to get your y value as close as you can to 12 (Lava spawns in caves at 10, and your y is up 2 for the positioning of your head) After you've decided on your length and finished a push you make another Hub in the same size as above. Continue until you reach the last of your hubs (You should end it before you hit bedrock, otherwise it won't be very nice looking). Torch placement is simple in this design. You will have 8 torches in each hub, on both sides of the bottom of the corners. If you want you may add a torch to the center floor to add more light, but it is enough to prevent mobs spawning as it is now. For every push you put two torches on every other left and right hangs. After you finished all of the cardinal pushes you'll be wondering what next to do, considering the amount you've mined you may want a place to store away items, connections are great for this. After your cardinal directions are done, you have your as many connections as you care for, what's next? You continue adding onto your bottom hubs, only with straight pushes. The bottom hubs will branch in all directions except backwards (Unless you're going with an open/mine variation) and each of those hubs may spread in the same direction so long as it's not backwards for the original hub. If you positioned well in the first central hub and push size, you'll be scraping a long in a fairly wide tunnel along the same height you find diamonds. It's easy sailing from here on. Central hub is under an area of flat ground, you put a three deep hole where torches will go, ladders go on the bottom and top, torches in the middle, you go above the hub as normal only there will be a 2 high gap under the hangs on this first hub to allow for the ladders as a way up. Due to update you will need the ladders to go all the way down, and such won't have a place for a torch. You can circumvent this by putting them on the middle of part left over at the top of the next section, the lighting is the same and you won't need an extra torch to prevent mobs spawning. This also works particularly well if you want to replace the top with glass. There are two variations, one where you will go up when you make a connection, so you will have a stack of hubs in all directions, another where you only dig down in the connections, where they intersect you build the 1 central path down to the hub. The latter is more efficient as all of it will eventually lead to the bottom and therefore be mining ore. The same as an Open Mine except your down path is one wide, not your up path. Same two variations, same correlation in efficiency. You can replace the torches in the center (If you placed them at all) of the hubs with a piece of glass and lava under it and it gives only one light less. You can change it for a 3×3 if you feel so inclined and have enough lava. This combines the Central Drop Shaft and optionally the Open and Maze Mine Connections. It requires close tallies if you don't want to combine them though. At your Hub you mine down the same as if you were going to make a Central drop Shaft, but continue until you are on the same level as your next hub (Depends on the size of your push, like a 8 push would be 8 blocks down) After you reach the bottom you make another hub in the same style as a Central Drop Shaft. This will require more ladders, so it's not a very good idea if your short on wood, but it allows a certain maze quality that I find welcome. There are two places where you can put the ladders, but the two per corner type of the Central Drop Shaft style is preferred, however the other style uses less ladders. You mine your shafts in the blocks directly north/south/east/west of the center so that you have 4 shafts all the way to the next hub, this require 5 blocks to hang down from the hub, some like it, others don't. Two variations on top of that, you may use the drop shaft for all your hubs, thus any hub with a hub above will be able to ascend, or you can only use the shafts for the central hub, adding 'terraces' to your mine. Where does open/maze mine connections come in? After you get down to the bottom level you may continue to stretch out and connect with the original push/hubs. Once you connect you may use the open style, leaving 1 wide path up or the maze, leaving 2×2 wide up. You will have a central rail system with smaller hallways for pedestrian traffic. On interesting locations, you should add some kind of rail station with access to the rail. Mining randomly is very simple: dig, dig, dig wherever and however you just happen to feel like digging at the moment. Very simple, and potentially the most rewarding type of mining around: you can find dungeons, massive cave networks, and maybe the enemy base. However, it is also potentially the least rewarding; it's possible to miss all the ores, as this method offers little consistency. Random mining can very well be the most dangerous method. You can get lost, mine your way into lava (and thus lose your items), into a ravine, into a skeleton spawner with 5 angry skeletons, or even into your own 40 block drop. Alternatively, you could embarrass yourself by mining straight up into a patch of gravel or sand, or flood your mine by digging into the ocean. That being said, there is one major benefit to random mining; it will confuse potential griefers. Surrounding a main base with all kinds of twisty passages is a viable option, though it won't ultimately stop a determined griefer from finding you or your base.This was the most used technique in Pocket Edition, before the update that introduced cave generation. Not to be confused with Strip Mining; however, this does involve a similar method. This form of mining involves someone to make a hall way and then make a small opening in the wall. From there, one must simply dig out a portion of the block to create a space. This method is repeated many times down the hall on either side to create rooms for various purposes, while finding several ores and valued materials in the process. This method is useful for the creation of houses, barns, indoor-gardens, storages, and in the creation of hard-to-find/secret places as it offers a variety of places one may go to in order to find something, but they may likely give up in the process unless they are determined. This is highly similar to Room Mining, except that instead of building rooms, you build tunnels. However, this takes much longer to do and tunnels are usually much larger than rooms. Because of this, Tunnel Mining is lesser to be used as the tunnels take up many tools in the process of making them as well as the mining process may dig into a body of water and flood the tunnel. However, if the player wants to make an artificial river for boats, this may not be a problem. Despite the fact that they may yield many resources, players may use up several pickaxes or shovels in the process of making them as well as torches to light up the tunnel. Players may get bored of doing this and may abandon the tunnels while still in the process of making them. Some may not consider beginning construction on future tunnels due to lost supplies and the tunnel not being rewarding enough to continue. This method is useful for making minecart subways, large indoor-gardens, art galleries, tree farms, boat rivers, large barn(s), mazes, doing construction on vertical and horizontal structures, constructing strip mines, and secret/hard-to-find areas by making tunnels that seem to go nowhere. The general purpose of Clear Mining (or Safe Mining, whichever one may prefer to call it) is a variation of Box Mining and other simple techniques. A player first finds a suitable area, preferably one block above the bedrock layer so that the player can easily obtain diamonds and other rare minerals. The player must also have at least 5 to 6 stone picks, one iron pick for rare minerals such as gold, and 3-4 shovels for gravel. A sword is optional depending on the players preferred difficulty settings. Once the player has found a suitable and deep area that they are confident in they may either begin or set up a small chamber near the area to store minerals and construct tools to further their mining. To begin, make a simple 1 block wide and 2 blocks high that spans roughly 8-10 blocks in length. Once this has begun, the player then uses their stone picks to mine directly in front of them where their tunnel ends, but, there is a catch. The player does not move once they make their initial 8-10 block tunnel, and mines only the above block of the two block height making a small box, 4 blocks long. Once the player makes a half tunnel 4 blocks long, the turn to their left or right and do the same; not breaking any of the blocks below the first block. (when done the concept is much more simple) After the player makes a reversed "T" shape, then the player can start to mine out the remaining areas around the tunnels, only using their reach length to clear away stone and any materials. Once the player has maxed out their reach length, they will be in small "box" that reduces risks of being suffocated by gravel or possibly lava. The player then should have a clear area, and then mines out the remaining second blocks, still avoiding the "edges" of the safety box. Once all materials are mined, the player can then break the box and gather the resources in one quick run. Once the player is done in this, there will of course be small "edges" that they not reach, and these should be mined out making a clear box. To further the effectiveness of this strategy, one may then place torches in the "frontal" corners of the area and repeat the process on each side, however this time, rotating their view to clear away all areas of their reach, so long as they are away from their initial entrance tunnel. The end result should be a very fast, resourceful, and safer approach to mining at bedrock. However, mobs may spawn in areas of the mine that are poorly lit, and lava is a factor, along with tediousness, so the player must make a commitment to a clear mine, leaving when satisfied with their bounty of materials. Like parenthesized above, this strategy is best played out rather than explained. Start with a basic U-shaped mine, and make an "amphitheater" down the levels until you have a one-block space. Then, make a doorway ahead to make another amphitheater mine. This is very useful, and you can even make it decorative by adding staircases as stairs or chairs. This is a simple mining technique, but isn't used much because of the risk of getting lost. Start by making a staircase down until you reach the level where the desired ore is most commonly found, and begin mining. Occasionally change directions and make multiple branches.If there is a rise, plow through it. If there is a fall, bridge it with cobble. The point is to cover as much area without changing your y coordinate. This form of mining is relatively simple. Find or make a cave. When you find ores, dig it out. Then, measure the longest side of the ore. Turn the small hole into a perfect cube and you'll probably find more ores. Simply create staircase to desired depth and make tunnel to find first granite, diorite, andesite or gravel. Dig out dirt or gravel and find minerals. This is an efficient way to mine iron and coal and it is very cheap. You need only shovels and one or two pickaxes, even without enchantments. If you fall into lava, do not panic; swim upward to get out, then try to get far away from the lava (to water if you can). This way even if you die, your stuff won't be destroyed by the lava. If you need to heal, eat golden apples or drink some Potions of Healing or Regeneration and hide in a corner/away from Mobs, and make sure you use a bucket of water if you have one. If you know you are going to die anyway, press F3 and F2 to take a screenshot of your coordinates. If you're burning to death, trapped, close to the lava, stand in a corner and encase yourself in a dirt (or other hand breakable) shell. Once you die your items will be contained safely in the shell. If you are trapped in blocks and are suffocating, try to dig looking downwards. This could assist you in getting out of the trapped pit. If you are fighting and are going to die, press F3 then F2. Whatever happens, you should look back upon what you did, and analyze how you died, and what you could do to improve. If your pickaxe breaks and you've stumbled into a cave and you have lost your way the only option is to punch your way out and this could take a while. If there are any nearby abandoned mine shafts, check them out, you can use the wood to make a crafting table and tools or there might be a spare iron pick floating around. If you can, get an Ender Chest and start to put in your stuff from the most expensive/important to the cheapest/least valuable. When you spawn back to your house, put another Ender Chest and take out your stuff. Should you happen to accumulate a large amount of resources, such as, perhaps, 2 stacks of iron ore and 10 diamonds you may be tempted to delve further into the cavern. Resist this urge and return to your base to empty your loot. Dumping off your goodies instead of trying to explore longer may help in the long run, and will reduce the chance of losing your loot. Having a bed at the base of your mine is also helpful; if you die, you will spawn at the base of your mine, hopefully surrounded by your chests full of goodies! If possible, carry an Ender Chest with you to store your valuable resources, or put down a chest where you are at, put your loot in it, and write down the coordinates of the chest. You can come back to the chest later. Find your current coordinates by pushing f3. When going for a mining trip, make sure that you take proper precautions to not die because of sand or gravel. Use your best judgement and be careful when digging. When going mining, after you are finished and you make your way back, try to go out the way you came. That way, you know you are safe and there is no risk of lava, water, gravel, or sand falling on you and killing you. Digging a new shaft to escape the underground could result in sand falling on you when it turns out you dug your exit below a desert biome. Or you could be drowned when the entire ocean floods your exit shaft. If you do get lost, you can dig up in a stairs pattern so that sand and gravel won't kill you and you won't be drowned if water comes through. If gravel does happen to fall on you, do not panic and immediately hold down the left mouse button to dig the gravel out. This will save yourself from suffocating. Never take valuable items when going mining. You don't want to delve into dangerous caves while carrying tons of iron and diamonds, for if you lose them while mining, you will be sorry. Carry more supplies for longer trips, but don't carry more than you can afford to lose to lava. Normally, you'll want to use stone picks for economy, but carry at least one iron pick for advanced ores (gold, redstone, and of course diamond). If you have tons of iron and are impatient, you might use iron picks in general, but while those are faster, they only last twice as long (block-wise) as stone tools, and you'll be going through a lot of picks regardless. Take a diamond pick if you want to be fast and efficient for its durability, or to collect some obsidian. Make sure to bring a sword, or at the very least, a bow and some arrows. Supplies to bring while mining: Crafting table, furnace, sticks, cobblestone, water bucket, picks, swords, food, armor and fishing rod. ABBA Rules is a style of caving introduced by VintageBeef where two or more members go caving for a set period of time, collecting ores with silk touch. Each ore is assigned a certain number of points. At the end the participants tally their points and the winner takes all the loot gathered by all parties. This competitive style of caving was inspired by a song called "The Winner Takes It All" by the Swedish band ABBA, hence the name. PvP is not allowed and participants typically make use of potions or Ender Pearls if they so choose. Iron and coal ore are not worth any points. Gold ingots found in chests may or may not count for points. Name tags, Horse Armor and other loot chest items may or may not count for points - they are usually worth between 7-10 points. Guude found a golden apple in a chest once which counted for 10 points?. One method for defending your mine is a tunnel collapse system. This essentially has the miner press a button to retract Sticky Pistons in the walls, pulling Torches off the walls. These Torches are supporting Sand or Gravel in the roof, preventing it from falling. When the Sticky Pistons retract, the Torches are no longer attached to the walls, and so they disappear. This allows the Sand or Gravel to fall, blocking off the tunnel. This can be used in a network style mine to block off the assaulted tunnels while still allowing movement past the blockages. It can also be used to trap assaulting mobs in a "Quarantine Area" and prevent them getting loose in the mine.